Greg Vassilakos, engineer and TMS member, first posted this commentary on the Friends of the Monorail Discussion Group. We thought the comments were worthy of a larger audience and with Greg's permission we have included them here. 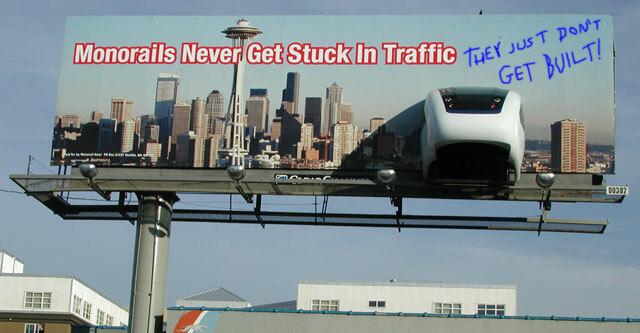 His comments were written a little over two weeks before Seattle's fifth vote on the monorail project. At the time Greg wrote this, it was widely anticipated to be the final vote, as support for the monorail had dwindled during the events leading up to the mayor-demanded election proposition to revamp or kill the project. 1. DBOM (Design, Build, Operate, Maintain) - The choice of the DBOM format for the contract set in motion the sequence of events that led to there only being one bidder (Cascadia Monorail Company-using Hitachi technology). The DBOM format created the environment in which the SMP felt it needed a single party to be liable for the entire contract. This was the stumbling block that caused Team Monorail to self-destruct and fail to bid (Team Monorail-using Bombardier technology). The DBOM format limited the competition for the project to just a few very large construction contractors. The shortage of teaming partners kept Monorail Malaysia from entering the competition. 2. Late Development of Finance Plan - The SMP should have had someone like Kevin Phelps onboard from the start (Phelps was hired in the summer of 2005 to be SMP's Independent Financial Policy Analyst). If the plan presented last spring had been Mr. Phelps's $7 Billion plan rather than the $11 Billion junk bond plan, the project would still be in trouble but the complete loss in public confidence in the SMP Board of Directors might have been avoided. 3. Lack of Continuous Public Involvement - If the project had been broken into a series of separate contracts for trains, maintenance facility, guide way segments, and stations, there could have been a process for continuous public review of individual components of the system. Instead, the SMP and Cascadia negotiated in secret for over half a year and then presented the contract design as though it were final. Both monorail critics and supporters immediately tore into the iris column design along Second Avenue. Cascadia and the SMP were caught unprepared. A weak response was offered that design changes could still be made, which left people wondering about the validity of Cascadia's bid. I'm keeping my fingers cross that a Westlake to Ballard monorail line will reemerge from the next round of transit studies. If such a line is bid in the future, I am sure the contract will not be DBOM. No sane contractor would consider bidding a large DBOM transit project in Seattle ever again.